I work at a vineyard in Nova Scotia Canada, My work requires a certificate in Viticulture in order to move higher in the ranks, dos this course provide a certificate that would be accepted here in Canada? Thank you Jamie, for getting in touch. Although we cannot guarantee that your certificate will be accepted, the knowledge and the skills you will learn from our course, should certainly be recognised. If you are with an employer, it is advisable to check with them before enrolling, to see if they have any particular requirements, or if they just want you to show that you have completed a bonafide and good quality course, which ours is. Getting accreditation throughout the world for every course that we do, would be very difficult; the time involved alone would be prohibitive. Therefore, we have concentrated on some key areas. Please click on the following link to see our recognition and memberships. The fact alone that we are a provider for RHS courses, shows that we deliver good quality learning. You may also like to look at our testimonials page, to see what previous students thought about us and what they were able to do with the qualifications they received. I hope that this answers your questions and please come back if you need any more information. Having read the details of the course I am very interested in enrolling but wonder what the maximum time scale is for completing the module is? It's good to hear from you. You will be pleased to hear that there isn't a maximum time scale. We encourage our students to work at their own pace until they have completed their course. 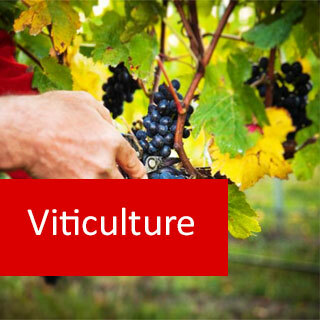 Viticulture course online. Learn the techniques and become a successful Vitculturalist. This course will help you develop an ability to select and cultivate appropriate varieties of grapes in different situations, and provide the knowledge to make informed decisions about the management of a vineyard. There are ten lessons covering the history of viticulture, the current state of the industry, wine and table grapes, dried grapes, cultural practices (trellising, soils, planting, pruning, irrigation, pests & diseases); vineyard design, improving quality, harvest & post harvest procedures, wine-making, marketing and more. A serious course for vineyard workers, hobby farmers, farm managers, amateur enthusiasts, or anyone working or aspiring to work in this industry. Choose an appropriate site for a vineyard. Choose appropriate grape varieties for different situations. Develop criteria to be considered when selecting which grape varieties to grow. Devise a procedure to establish a vineyard. Specify the techniques used in the culture of grape vines. Specify a procedure for harvest and post-harvest treatment of grapes. Formulate marketing strategies for vineyard products. Explain the basic principles of wine making. Appropriate grape varieties for different situations. Ways to ensure or improve grape quality. Care and consideration should be taken in selecting a site and establishing a new vineyard. Good planning and site establishment will make management easier and improve chances of vineyard success. Vineyard establishment generally involves several key aspects. These include planning, site preparation, soil conditioning, installing cropping infrastructure such as irrigation and trellises, installation of other infrastructure such as roadways and packing sheds, and plant establishment. Every vineyard needs a plan specifically tailored to the site, the locality, the scale of the enterprise and the owners’ requirements. Given that each enterprise has different priorities, and operates under a different set of circumstances, it is impossible to follow a "generic" or standard approach to planning. You do need to plan all aspects which are important to your operation, including production, finance, land care, facility and equipment management, marketing, product processing (if relevant), and physical layout (ie. design of the property). A well-organised and experienced grower may not need to be too rigid in adhering to a procedure like this; however, many growers will find a real benefit in working through a systematic procedure "on paper". The surest way to succeed is to move through this procedure step-by-step; writing down everything as you go. This gives you a chance to ponder over what you have written, add new thoughts, or make alterations. Some decisions will have a greater impact than others (eg. buying new land or changing agents). Obviously more significant decisions warrant more careful planning. Some decisions need to be made repeatedly and frequently (eg. managing weeds, irrigating, buying fertiliser or machinery). Good planning may involve establishing a procedure to help with such decisions (eg. re-order when the quantity in stock drops to a certain level). Some decisions need to be made straight away (eg. a regular weeding schedule, soil moisture monitoring, treatment of a serious disease), while others might not matter if they are delayed (eg. replacing a fence). Some decisions are more permanent (eg. planting a new variety), while others are easier to change (eg. the amount of water applied a particular point in time). Good planning will assist the viticulturist in developing a vineyard that maximises the effect of positive elements of the site, such as aspect or soil type, and minimises the effect of negative elements, such as frost potential. The first step in a property development strategy is to draw a vineyard plan. Drawn to scale and illustrating important attributes such as contours, creeks or streams, hills, cliffs, and other features, this map will aid in the appropriate exploitation of usable land. Details such as existing trees, river banks, fences, soil types, direction of summer and winter winds, will aid all future planning processes. If you have recently purchased the property, some of this information may be available from previous farm owners, local council departments and even state or national government land departments. Some information will be found by observing conditions on the site. The inclusion in the map of existing buildings and knowledge of work patterns and access routes will allow efficient time management and will also enable optimum siting of future buildings. If sheds and the farm residence are placed close together it will reduce time to get from work to home, aid in better husbandry of vines, improve security around the property, and reduce transportation between various components of the property. If it is a new farm location, careful placement of the buildings may even reduce costs. For instance, placing a house close to the road will reduce the connection costs of electricity, water and other services. The siting of the house and farm buildings should take into account the agricultural value of land, the central location of the house to all useable land, flood levels, etc. Good land should not be built on – it should be reserved for agricultural use, but if the property is flood-prone, then a compromise needs to be made. Check how often the land has been flooded. The location of farm buildings may also be determined by their use and function in the running of the farm, e.g. manure storage area should be downwind to residences. Consider the downwind land uses in neighbouring parcels of land. Always remember to allow appropriate thoroughfare for machinery. Ensure safety when driving machinery in terms of overhead powerlines, steep slopes and edges of access tracks (weak shoulders and gullies). Having a natural source of water on the land is every farmer’s dream. Considering it is actually a resource, many districts require registration for tapping that resource. Extra care is needed when looking at the potential of farm pollution into the waterways by others upstream of your property. Water problems can relate to underground water movement as well as more obvious surface water. Both types of water can bring pollutants from outside of the property. Note that a licence is usually required to sink a bore or to install a pump from a surface water supply (eg. river or lake), with the volume controlled by the licence requirements. Water quality is important for crops, animals and humans, and a water purity and quality assessment is therefore recommended. In remote districts, it is crucial to employ water conservation techniques such as water harvesting, selection of dry land species, etc. Fencing should be placed to optimise land use, assist ease of access through the property, mark off damaged areas (eg. unstable ground, erosion-prone soil) and to restrict animal access to vines. Efficient farming depends a great deal on getting your priorities right, identifying those tasks on the farm which need to be done before other jobs are undertaken. For example, this may mean finishing the vineyard fencing before the shed extension is started, so that animals will not stray and damage the vines. Money is one of the biggest burdens for the commercial viticulturist and anybody considering a new operation or expanding an existing vineyard must identify their present financial limitation so they can plan the enterprise fully aware of financial constraints. These constraints may slow down the full operation, but it is a safe management strategy to follow. Take one step at a time; do not jump in head first.